Glucosamine helps to maintain structural integrity of joints and connective tissues. Chondroitin helps to lubricate, cushion and support joints. MSM (methylsulfonylmethane) is a component of bones, teeth, and collagen and works well with extra strength Glucosamine and Chondroitin. Glucosamine helps to maintain structural integrity of joints and connective tissues. Chondroitin helps to lubricate, cushion and support joints. MSM (methylsulfonylmethane) is a component of bones, teeth, and collagen and works well with extra strength Glucosamine and Chondroitin. Now you can get all of the benefits of Joint Free in just 2 easy-to-swallow super coated tablets per day. Other ingredients: Cellulose, coating (titanium dioxide, polydextrose, hydroxypropyl methylcellulose, tracetin, polyethylene glycol, sodium, carboxymethylcellulose, dextrin, dextrose, glycerin, soy lecithin and sodium citrate). Silicon dioxide, magnesium stearate, N-acetyl D-dlucosamine and potassium chloride. For best results, take 2 (two) tablets at once with a meal or 1 (one) tablet twice daily with meals. 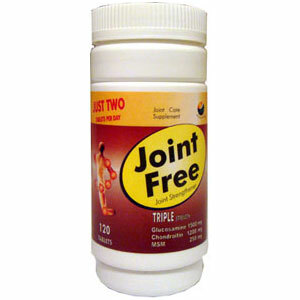 Be the first to review “Joint Free Joint Strengthener” Click here to cancel reply.